This is the place for dining after La Scala. 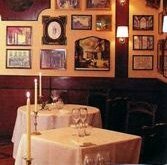 Open late and nearby in the Grand Hotel et de Milan up the street, it gets good reviews year after year. The cuisine is updated Italian classics and the decoration is theatrical with dramatic memorabilia and sketches. A good spot for romance. A gourmet menu costs €75 or six courses (two-person minimum), excluding wine. Closed in August.